Late September and early October in the UK is usually a time of upfronts and award ceremonies for many of the leading out of home media owners and this year is no different. First of all, and for the second year in a row now, JCDecaux are holding an event (Wednesday October 4, 2017) as part of the IAB UK Digital Upfronts (the IAB describe this as “a showcase of premium digital advertising opportunities from the UK’s leading content creators, media owners and technology companies” – Facebook, Google, Twitter etc also have events that week). JCDecaux’s invite only event last year was truly superb and this year it looks set to be even better. We see that Les Binet, Head of Effectiveness at adam&eve DDB is one of their guest speakers (we believe they have two guest speakers but the other has not been announced yet). Les Binet of course is one of the world’s leading authorities on marketing effectiveness. We understand that he will take to the stage to challenge the industry to reconsider approaches to efficiency in the changing media landscape. The JCDecaux upfront takes place 08:30 – 11:00 am at Hansom Hall, St, Pancras Renaissance Hotel London, Euston Road, NW1 2AR. Whilst not an upfront per se, note also that on Thursday October 5, 2017 Ocean Outdoor will be having a prestigious award ceremony for their Digital Creative Competition, being held as usual, at the London IMAX. Finally, on Wednesday October 11, 2017 Clear Channel UK will be holding their own upfront (details to follow). Copies of DOOH INSIGHTS Volume 6 will be available at all of these events. 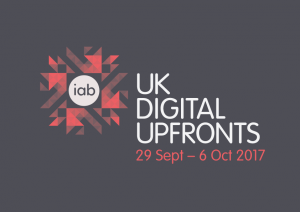 The IAB UK Digital Upfronts take place Friday September 29 through to Friday October 6, 2017 and you can click here to see what is taking place so far that week. This entry was posted on Thursday, September 7th, 2017 at 08:53 @412 and is filed under DailyDOOH Update. You can follow any responses to this entry through the RSS 2.0 feed. You can leave a response, or trackback from your own site.